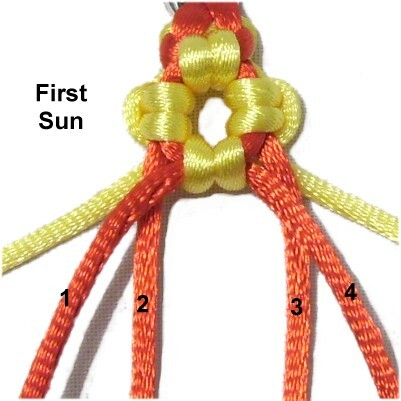 Description: The Sun Bracelet features a unique combination knot called the Aztec Sun Bar. 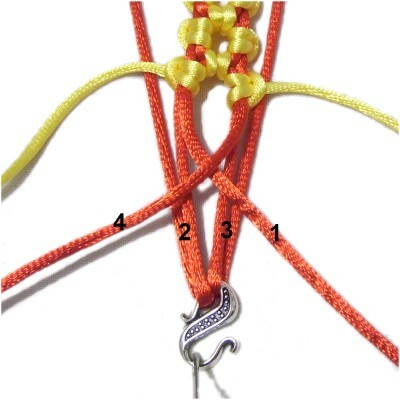 Part of the design is made with the Vertical Larks Head knot, which gives each tiny "sun" it's rounded shape. You also use Half Hitches to make extra loops. 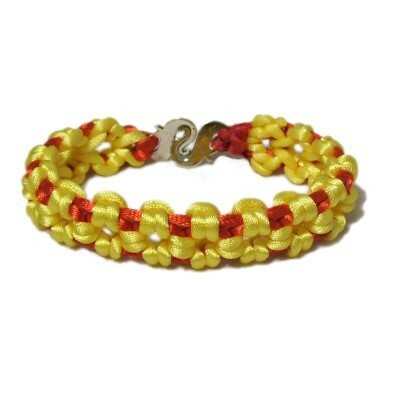 To truly make this Micro-Macrame bracelet sunny and bright, use either orange or yellow as the primary color. The holding cords should be red. Any type of clasp can be used. Keep in mind that it needs to be large enough for two cords to pass through it. Satin material was used to make the bracelet shown. Make sure you do not push pins through this material if you plan to use it. Lean the pins over the cords, or use the Cross Pin technique. 2018 Update: This page has been changed so it now matches the new instructions for the Aztec Sun Bar. Contact me if you need the original page. Preparation: Cut two holding cords and one working cord using the information below. 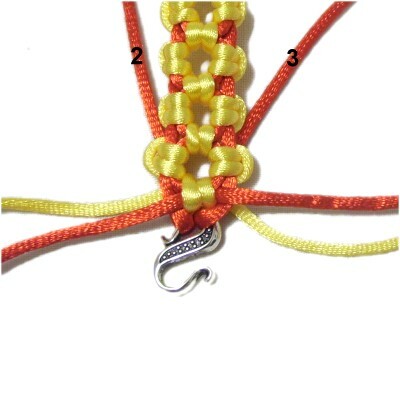 To make the Sun Bracelet in sizes different than those listed above, multiply the finished size by 13 to determine the length of the working cord. Step 1: Pass both holding cords through the opening in the clasp. Match the ends to balance each half. Mentally label the four segments as shown. Place a small piece of tape on segments 1 and 4, so you can locate them easily. 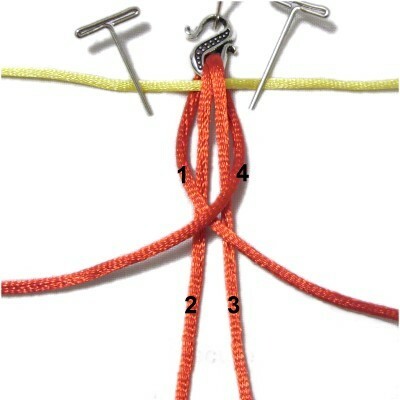 Place the center of the working cord next to the clasp, and arrange it horizontally. 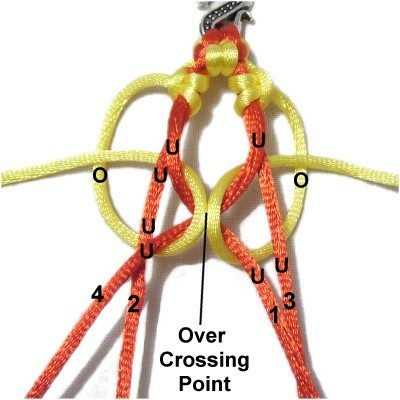 It should rest under holding cord segments 2 and 3, and over segments 1 and 4. Cross holding cord segments 1 and 4 right over left, resting on top of segments 2 and 3. 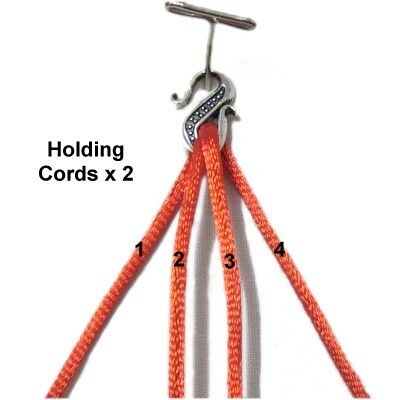 Step 2: Move the right half of the working cord under holding cord segments 3 and 1. Bring it over the crossing point of 1 and 4. Move it to the right, passing under segments 3 and 4. 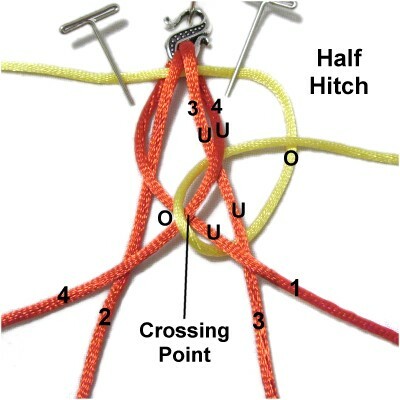 Bring it over the working cord to complete the Half Hitch. Designer's Tip: Each time you make the Half Hitches for the Sun Bracelet, just remember that the working cord passes over the holding cords only at the crossing point. It passes under all the other areas of the holding cords. 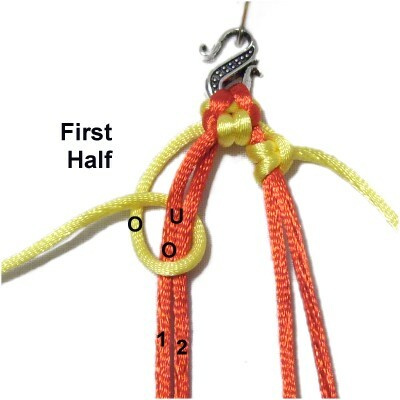 Move the left half of the working cord under holding cord segments 2 and 4. Bring it over the crossing point. Move it left, passing under segments 1 and 2. Bring it over the working cord to complete the Half Hitch. 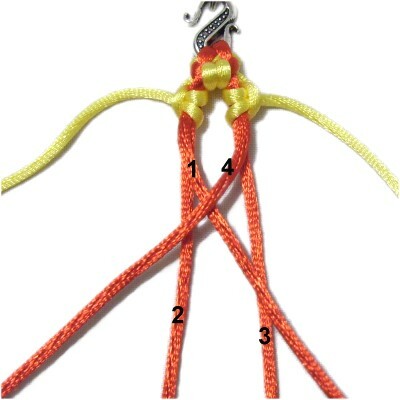 Tighten the loops by first pulling on holding cord segments 1 and 4. Then tighten the two Half Hitches. Mentally re-number segments 1 and 4, and make sure segments 2 and 3 are between them. 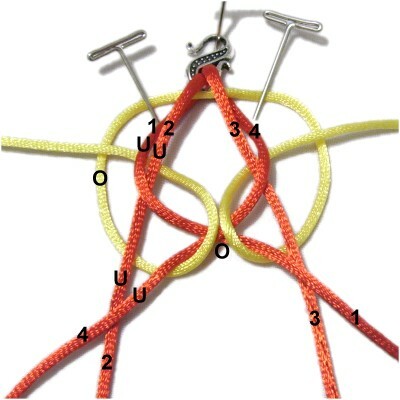 Pass the working cord over - under segments 3 and 4 of the holding cord, rotating clockwise. As you pull it right, pass over the working cord. Tighten firmly. 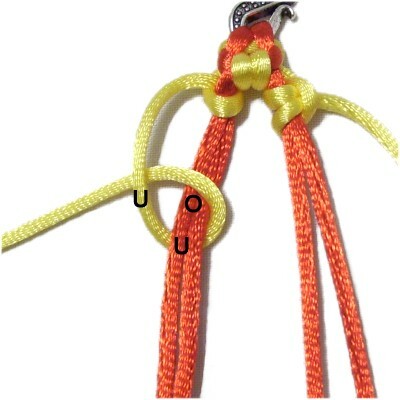 For the second half of the knot, pass the working cord under - over the holding cords. As you pull it right, pass under the working cord. 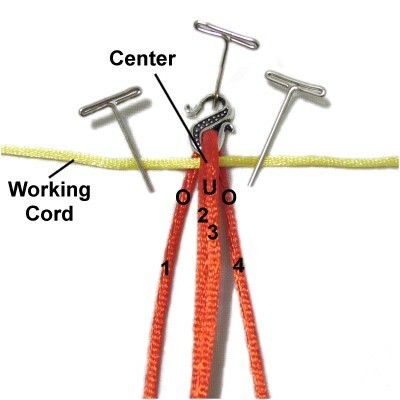 Pass the working cord over - under segments 1 and 2 of the holding cord, rotating counter-clockwise. As you pull it left, pass over the working cord. Tighten firmly. As you pull it left, pass under the working cord. Step 5: Cross holding cord segments 1 and 4 right over left, resting on top of segments 2 and 3. Repeat step 2 to make the next pair of Half Hitches with the working cord. 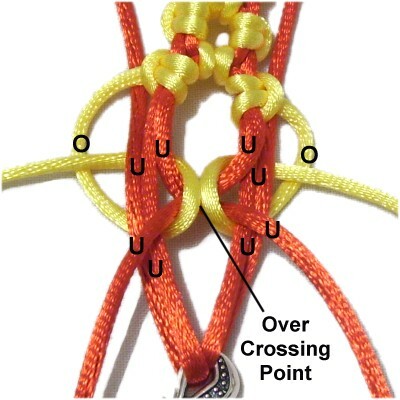 Remember that the working cord passes over the holding cords only at the crossing point. It passes under the remaining segments. 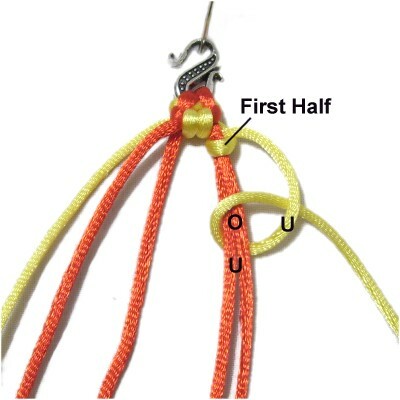 Pull on holding cord segments 1 and 4. Then tighten the Half Hitches. Step 6: Repeat steps 3 - 5 several times, until the Sun Bracelet is the size you planned to make. 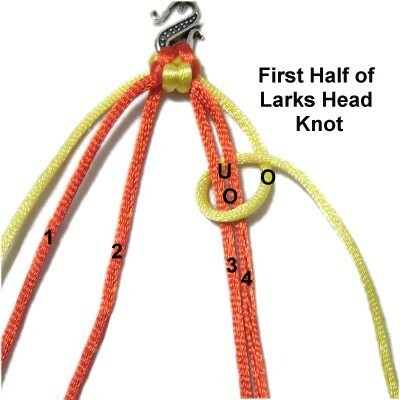 Stop on Step 4 (left Larks Head knot). 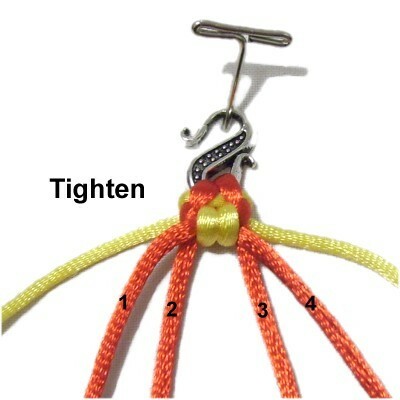 Designer's Tip: The following information shows you one way to attach the other half of the clasp. 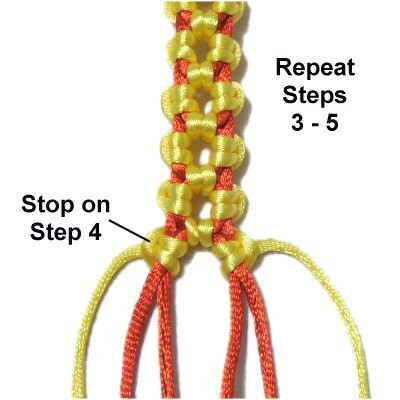 There are other ways to accomplish this step, depending on the type of clasp you are using. You may need to experiment to figure out which method works best for your project. Step 7: Pass holding cord segments 2 and 3 through the other part of the clasp. 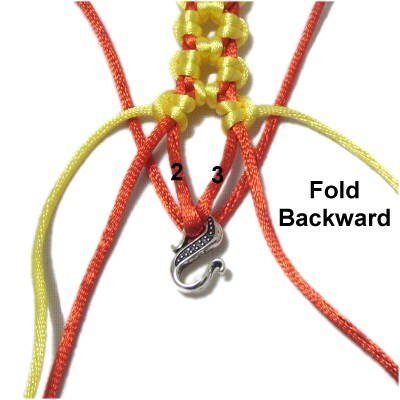 Fold them backward towards the knotted portion of the Sun Bracelet. Make sure you leave room between the clasp and the Larks Head knots. Repeat step 2 to make the two Half Hitches with the working cord. The only change is that you need to go around both parts of segments 2 and 3, since you folded them. Step 8: Start the finishing process for the Sun Bracelet by pulling on holding cord segments 2 and 3. This will move the clasp close to the last "sun". Move the other cords to the BACK of the design and slide them under at least 1 loop to hold them in place. Apply glue to secure them. When it's dry, cut off the excess material. Have any comments about the Sun Bracelet? Contact Me.